In general, we know what the long-rumored, even-longer-awaited Jeep Wrangler pickup will look like: Boxy, upright, with round headlights and a seven-hole grille. 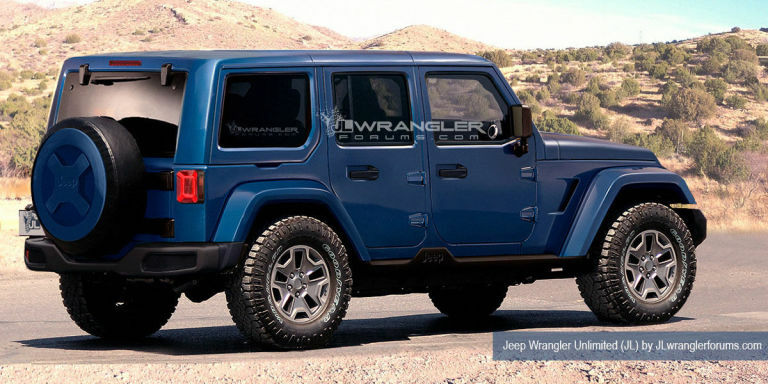 But the success of this model will no doubt come down to the details, and thanks to the insiders at JL Wrangler Forums, we've got a good glimpse at what the Wrangler pickup could look like. 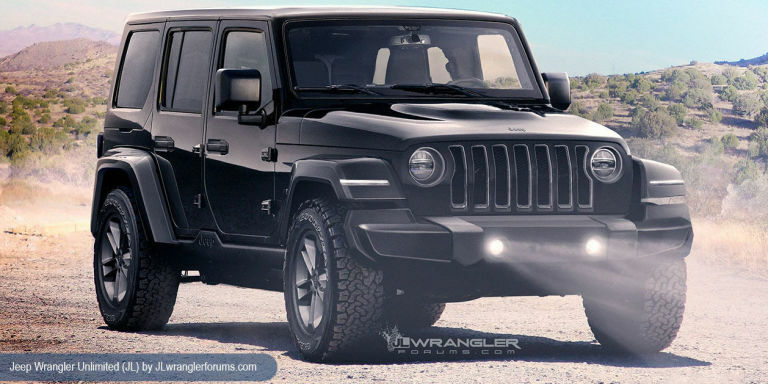 Based on the latest insider info, JL Wrangler Forums whipped up best-guess renderings of how the next-generation Wrangler could look as a two- and four-door Rubicon pickup. Of note, the in-the-know forum folks say that the pickup will share its windshield, grille, headlights, bumpers, front fenders, and hood with the regular Wrangler. However, the pickup won't have the JL Wrangler's character line that runs below the windows on the front and rear doors, though the pickup bed will apparently feature its own horizontal crease. The fender vents behind the front wheel openings will likewise go missing, the forum posters maintain. 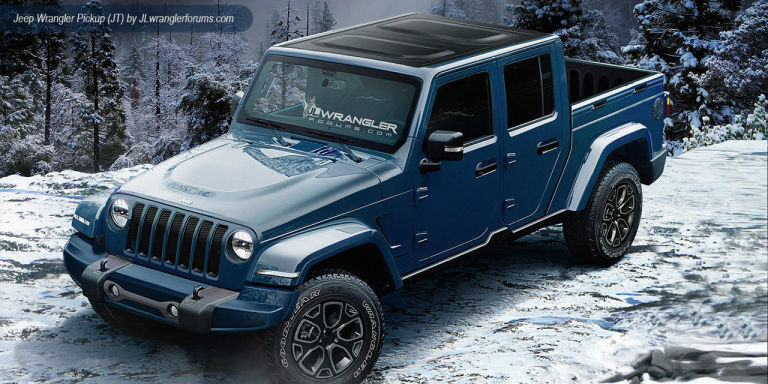 For comparison, here's JL Wrangler Forums' rendering of a four-door 2018 Wrangler Rubicon Unlimited: Other pickup truck features to pay attention to: It's expected that the leading edge of the truck bed will be angle-cut to follow the shape of the door opening, rather than a vertical gap between bed and cab as seen on most traditional pickup trucks. 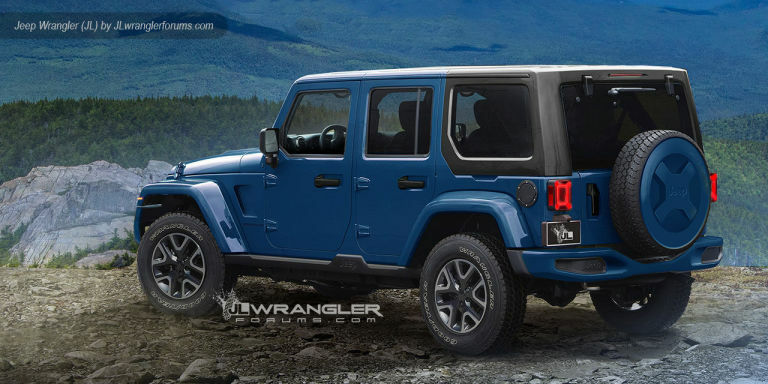 JL Wrangler Forums also suspect that the pickup, like the two- and four-door Wrangler, will feature a new door hinge design and updated pull-style door handles, replacing the current generation's push-button units. We're most interested in the idea of a two-door Wrangler Rubicon pickup—a vehicle that, should it go into production, would offer all the right-size off-road ability of a Wrangler with more utility than any previous generation of the storied 4x4. JL Wrangler Forums put together every detail we've heard about the new Wrangler and Wrangler Pickup into one styling exercise. We've been hearing a ton of little details about the upcoming, all-new 2018 Jeep Wrangler. It's going to have an aluminum-intensive body, available in two-door, four-door, and, finally, pickup truck styles. We've seen spy photos of heavily camouflaged test mules. And now, thanks to the folks at JL Wrangler Forum, we have a speculative rendering of what the final product will look like. Like the 2020 Ford Bronco illustrations we debuted earlier this year, these 2018 Jeep Wrangler drawings aren't official Jeep illustrations. They're speculative sketches, penned by skilled and knowledgeable people who nonetheless aren't affiliated with Jeep in any way, and published here with JL Wrangler Forum's permission. But they synthesize all of the details we've heard about the new Wrangler's design into one coherent, convincing design. Let's take a closer look. .At first glance, this sketch looks very similar to the current-generation JK Wrangler that's been around since model year 2007. That's not a mistake: the Wrangler is one of the most successful vehicles in Fiat Chrysler's entire lineup, and Jeep likely doesn't want to mess with success by altering the styling too much. But the details make the difference. Check out how the headlights jut into the outer-most grille openings, a tribute to the Wrangler's predecessor and inspiration, the CJ. The grille is no longer flat: the top portion leans back, a design element last seen on the TJ Wrangler (1997-2006). This, plus the more raked windshield, are likely intended to improve the Wrangler's aerodynamics. This rendering includes bumpers that reach up to close the gap with the front fenders, another aero trick previously only seen on European-market Wranglers. Front turn signals have moved from below the headlights to the leading edge of the front fenders. At the rear, the JL Wrangler Forum renderings show a more raked, smoothed greenhouse. X-pattern taillights echo the jerry-can-inspired design currently seen on the Jeep Renegade. The roof design has been a particularly important question with the new Wrangler. Rumors hold that Jeep will replace the current removable roof with a permanent roof structure featuring pop-off top and side panels. This would improve structural rigidity, improve crash safety, and potentially reduce weight by eliminating the separate roll bar structure currently used. The JL Wrangler Forum rendering shows how this removable-panel roof design could be incorporated into the four-door Wrangler Unlimited as well as the pickup truck, a design that coincides with renderings we've previously published. We expect most of the hallmark features of the current Wrangler to stick around in the new model. Details like the exposed door hinges (allowing for Jeep's trademark removable doors), the tailgate-mounted full-size spare tire, and the overall shapes of the windows and door openings, all contribute to a design largely similar to the current Wrangler. Under the hood, we expect an available turbocharged 2.0-liter four-cylinder making as much as 300 horsepower, hooked up to either an eight-speed automatic or, praise heavens, a six-speed manual. That hood, interestingly, gave us a clue about how similar the styling would be: A current Wrangler inadvertently got what seems like a 2018 Wrangler prototype hood from an auto parts recycler that, when installed on a 2014 Wrangler, almost fit save for a two-inch overhang. For a more in-depth explanation of the design decisions that went into these speculative, unofficial, but good-looking renderings, check out the post on JL Wrangler Forums. And for even more details on what we expect to see in the upcoming Jeep Wrangler, here's everything we know so far. What It Is: The 11th-generation descendant of the warrior that helped win freedom in World War II. Why It Matters: Jeep sold more than 200,000 Wranglers last year. It’s a cash-spewing ATM that pays a lot of the company’s bills. It’s also the heart of the Jeep brand. Platform: Jeep will continue with rugged body-on-frame construction to serve the off-roading aspirations of its faithful and multiplying constituents. That said, the coming edition will use modern materials to cut weight and boost mileage. Expect a hydroformed steel ladder frame carrying a body made of high-strength steel, aluminum, and plastic. A four-door pickup will join the lineup of two- and four-door models with hard- and softtops. Powertrain: Today’s 3.6-liter DOHC V-6 will soldier on with manual and automatic transmissions. Fiat Chrysler’s current product plan also includes a turbo-diesel alternative in the near term and a hybrid after 2020, along with a possible turbocharged gasoline four-cylinder code-named “Hurricane” making around 300 horsepower. Competition: The Wrangler is without peer, a gully-busting rock climber you can drive to work. Compact crossovers bow in its presence. A new Land Rover Defender, expected next year, may re-invade this sphere, though at twice the price. What Might Go Wrong: Failure is not an option. With Ferrari pawned off, Jeep is Fiat Chrysler’s hero, the rare American brand with global admiration, solid profitability, huge sales potential, and a brilliant future. Estimated Arrival and Price: Late next year, with stickers starting around $25,000. Jeep hasn't sold a pickup truck since 1992, when the XJ Cherokee-based Comanche went out of production, but it's teased us many times since. Now, we know that a Wrangler pickup is on its way, and it's high on our list of cars we can't wait to drive. To say we're excited for the Wrangler pickup would be an understatement, so let's round up everything we think we know about it. Jeep arguably started the Wrangler pickup fever in 2005 with its Gladiator Concept(pictured above), but it never reached production. A handful of concepts since only served to whet our collective appetite further, but they remained concepts. Finally–finally!–Fiat Chrysler CEO Sergio Marchionne confirmed earlier this year that Jeep will offer a pickup version of the next Wrangler. In an interview with The Detroit News at this year's Detroit Auto Show, Jeep CEO Mike Manley confirmed that the Wrangler Pickup will come late next year, following the arrival of the next-generation Wrangler. "Sergio and I work very, very closely on the Jeep product portfolio, and both of us have been a fan of a potential Wrangler pickup," said Manely in an interview with The Detroit News. "For me, there is a historical place in our lineup for it. " We first heard rumblings of a pickup based on the next-generation Wrangler in September of last year. Of course, people have been clamoring for it for a much longer time. Jeep will continue building the current-generation Wrangler until March 2018, but production of the new Wrangler starts late next year. Jeep hasn't revealed too many specifics on the next Wrangler, but we have a decent idea of what it'll be like. It's supposed to retain its classic body-on-frame construction, but it might get a new aluminum-intensive body. Like Ford with the current F-150, switching to lightweight aluminum construction could help fuel economy, never a strong suit with the Wrangler. Diesel and hybrid Wranglers are also rumored, but yet to be confirmed. Like the current Wrangler, the #Wrangler Pickup will be built in Toledo, Ohio alongside the non-pickup truck version. Yes, Jeep built a heavily modified Wrangler with a 707-horse supercharged V8 from the #Hellcat earlier this year , but it's just a one-off fever dream. Don't fret though, because if you want a Hellcat motor and a seven-slat grille, the Grand Cherokee SRT Hellcat is coming next year. Americans love pickup trucks, and Americans love Jeeps. Sergio Marchionne knows this, so building a Wrangler Pickup is a complete and total no brainer. It'll also be wildly different than every other pickup currently on sale, which should help it further. One of the most famous Jeep’s products is its off-road vehicle Wrangler. The SUV was always made to challenge toughest terrains, and during the years base with huge number of fans was obtained. Now, new generation is on its way, and firs model should be 2018 Jeep Wrangler. We suppose that next year will be a year of pickups for this company, but after that crossovers take the scene. With new generation, new features are coming, and there are some exciting news about features list and systems included. Legendary crossover will have some same features and solutions as current model. As we heard, independent suspension is coming with 2018 Jeep Wrangler and it was used first for Jeep Wagoneer 50 years ago. With floating solid axles it gives high ground clearance, which should improve off-road skills. Frame is going to use a lot of aluminum, and according to some rumors, not all-aluminum parts will be used. There will be also hydro-formed steel frame. Fans was worried about reducing off-road capabilities, but Jeep’s spokesmen told there is no need for worries. There will be few engine options for crossover since there are various demands from buyers from different parts of the world. We are sure that V6 drivetrain is going to take position under the hood of the 2018 Jeep Wrangler. It is certain that North-American vehicles will use diesel as its fuel. This improves low-end torque and off-road skills. A year or two after the launch of the 2018 Wrangler, hybrid version could come out with improved fuel economy. European models will get only diesel model, but displacement wasn’t unveiled yet. New Wrangler is going to be more aerodynamic with slant larger than before. Vehicle is going to use 8-speed auto transmission, while 6-speed manual is optional. Some options for other models are Chrysler’s second-generation eight-speed gearbox and ZF 8HP75. Due to bigger use of the aluminum, weight is going to be reduced, and with it, 2018 Jeep Wrangler becomes more fuel-friendly. Mileage is boosted by few miles per gallon and this could be additional advantage for luring potential buyers. Upon speaking with Mike Manley of Jeep, after publishing this mornings update, he has informed us that the Jeep Wrangler pickup will actually be available prior to 2019. In a one-on-one exclusive sit down with Mike Manley, Head of Jeep Brand, at the 2016 North American International Auto Show in Detroit, he officially confirmed the long rumored Jeep pickup will be here by 2020. Manley confirmed our earlier suspicions about a new Jeep Wrangler base Pickup. Manley was only able to confirm production of the pickup and no specific details were given. With the recent introduction of the all-new Honda Ridgeline, Toyota Tacoma, Chevy Colorado, GMC Canyon, and rumored Nissan Frontier and Ford Ranger the end of this decade is shaping up to be amazing for the midsize truck buyer. We will keep you updated with any more developments on the upcoming Jeep truck as soon as they become available. In an announcement to the Toledo plant management this morning Fiat Chrysler Automobiles (FCA) revealed their plans for keeping Jeep Wrangler production at the Toledo, Ohio plant, while moving production of the very popular Cherokee to an undermined plant. Automotive News was able to confirm in a separate announcement that a Jeep Wrangler based pickup will be built at the Toledo plant in 2017 or 2018. There are two plants at the Toledo Assembly Complex, one that manufactures body-on-frame vehicles and another one that manufactures Unitbody vehicles. The current plan would require the Unitbody facility to convert to body-on-frame assembly line before the launch of the redesigned Wrangler, which is expected in 2018. Jeep Truck fans have been begging for a new model truck and the Jeep Gladiatorconcept only made that desire stronger. After many years of being teased with a new Jeep truck we are excited to find out one will be coming again. There has been no information on the pickup other than it will be coming and be built in Toledo. With the popularity of the midsize/compact truck rising again thanks to the GMC Canyon, Chevy Colorado, redesigned 2016 Toyota Tacoma and the likely return of the Ford Ranger, the Jeep Truck could be a formidable challenger to the growing market. We will keep you updated on more Jeep production changes and any more information on the Jeep Truck because we want one too! Future Rival To The Ford Ranger? In the pickup market, toughness matters. So does rugged, iconic, like-no-other styling...such as that of the Jeep Wrangler. Well, then; what about a pickup truck based on the Jeep Wrangler? Fiat Chrysler Automobiles (FCA) has been considering it for some time—actually for many years, if you consider the 2005 Jeep Gladiator Concept. And now, based on recent reports, citing Jeep global chief Mike Manley and FCA CEO Sergio Marchionne, it’s a go. You’ll have to wait a while. No exact name has yet been announced for this 2019 Jeep Wrangler pickup—Scrambler would be the natual, of course, but a few more details, including the potential name of the model, are expected to be revealed later this month as part of a new product plan. The Jeep Wrangler pickup will be built in Toledo, Ohio, alongside the next-generation version of the Jeep Wrangler. It’s hard to imagine a more rugged take on a compact pickup, and it’s an idea that could go over well as a niche truck in overseas markets. While most other SUVs are built on platforms that are shared across several models, the Wrangler is one-of-a-kind, and it’s built essentially on a standalone platform—one that’s become increasingly expensive to keep modern and updated to tightening safety and fuel economy requirements. So a wider range of Wrangler variants should help assure more return on investment. Updating a story we first reported on in January of 2013 on the Jeep Wrangler Pickup Truck. IT’S HAPPENING!!! Two universal desires you’ve probably heard Jeepers voice over and over again since what seems like the beginning of time (or at least since the good ol’ Willys Jeep days) are their fiery hunger for a diesel powered Wrangler and yearning for a factory-built Wrangler pickup truck. Today, AutoNews sung sweet melodies to off-road enthusiasts around the world by announcing that Mopar plans to finally execute on one of Jeeper’s age-old desires–a production Wrangler truck is officially in the works for either the 2017 model year. We’re Finally Getting A Jeep Wrangler Pickup Truck! According to a recent article from Automotive News, the highly anticipated Jeep Wrangler pickup truck will hit lots sometime in 2017 or 2018. Which is huge news for Jeepers, considering theNew 2017 Jeep Wrangler is expected to come out around the same time. According to suppliers close to the situation, the redesigned Jeep Wrangler, which will come in both two and four-door, and the Wrangler-based pickup are expected to reach a production number of 350,000 per year, meaning you will have your fair share of chances to get your hands on either the new 2017 Wrangler or Wrangler pickup truck. At this time, there is no word or concepts of the Wrangler-based pickups exterior or interior. We believe the Wrangler truck will utilize aluminum parts like the next-gen Wrangler and will also come stock with a small turbocharged four-cylinder diesel engine. We also expect the Wrangler pickup to enter the market competing with the Chevy Colorado, the GMC Canyon and the Toyota Tacoma. However, aesthetically, we are left to wonder if it will look the 2015 Jeep Gladiator concept or something completely different! From what we know, this redesigned 2017 Wrangler is going to hit lots sometime in 2017 as a 2017. Although a full aluminum body was rumored for months, it has been confirmed that the 2017 Wrangler will not be an all-aluminum body but will instead utilize aluminum body parts such as the doors, hood and tailgate. It is also expected to come with solid axles in both the front and the rear, making it easy to modify it with aftermarket parts. To cut additional weight, and meet the new fuel economy requirements, it is rumored that Jeep will swap the traditional safety bar from the top in favor of a set of permanent tubes. This change reduces the weight of the vehicle by eliminating the need for lower-body reinforcement the safety bar requires. I Thought Mopar Already Built a Wrangler Pickup Truck? Not really, kinda, but not really. Back in 1981 Jeep produced a number of CJ-8 “Scrambler” model CJs for the US market. These “trucks” were a long wheel-based version of a standard CJ-7 that would later be replaced by the CJ-8 and by 1986 would be replaced by the Jeep Wrangler. The “scrambler moniker came from an appearance package that included a diverse graphics package and special-edition wheels. However, only 230 were sold in the States and less than 28,000 were built world-wide from 1981-1986. Next, Jeep produced the Jeep Comanche or simply “MJ” from 1985-1992. While this also was not a tried and true Wrangler, it was however a very capable off-road vehicle produced and endorsed by Jeep. A spin-off from the Cherokee XJ, the Comanche could be had with the Metric Ton package on long-bed models that included, among other things, a Dana 44 rear axle and increased towing capacity that exceeded all other mid-sized trucks. This would be Jeep’s last dance with a production truck built for the US market. The JK-8 concept was released by Mopar as a post-factory add-on for Wrangler Unlimited models. This truck conversion kit featured Mopar-stamped and welded steel paneling, removable fiberglass roof, JK-8 badges and of course a fully converted pick-up bed. It’s basically the Scrambler of JKs in the form of a Mopar built and sanctioned kit, though not a factory “Wrangler truck” like the newly announced version coming with the next generation Jeep Wrangler. When Are We Getting The Next-Generation Wrangler Pickup? The jury is still out on this one officially, but many signs point to a late 2017 release for the newly redesigned Wrangler and a Jeep slideshow displaying the company’s plans over the next five years stated a 2017 redesign as well . It would be expected the truck version to be released very shortly after new model Wranglers start showing up on dealer lots. Might We See A Diesel Powered Wrangler Truck? To many a Jeeper, this is an answer to a long-awaited prayer. With rumors of the 2017 Wranglergetting a 30+ MPG V6 EcoDiesel, many are anticipating a lighter (possibly us an assortment of aluminum-based parts), more fuel efficient Wrangler that will bring along a greater selection of models and options. Only time will tell us for sure, but with how Jeep sales have looked recently, banking on a diesel is a pretty safe bet. DETROIT -- Fiat Chrysler has decided to keep making the Jeep Wrangler in Toledo, Ohio, move production of the Jeep Cherokee to a nearby state and build a Jeep pickup. The news comes after 11 months of uncertainty about the fate of Wrangler production in its historic home. Details about the Wrangler and Cherokee were shared with Toledo plant management this morning in response to inquiries from Automotive News, based on an exclusive interview with CEO Sergio Marchionne on Aug. 21. Automotive News has learned independently that Jeep will make a Wrangler-based pickup in Toledo, a move that will soften the blow of a transferred Cherokee -- Jeep’s best-selling vehicle. Jeep showed the Gladiator concept, a Wrangler-based pickup, in 2005. Marchionne said that the automaker has “found a solution” to how best expand production of the Wrangler -- in Toledo. Details of the plan will be announced after FCA’s contract talks with the UAW conclude; the contract expires Sept. 14. Separately, Automotive News has confirmed that the plan includes building a long-sought Wrangler-based pickup, likely in 2017 or 2018. That vehicle is under development. An FCA spokeswoman said the company would not comment and that the CEO’s quotes stood for themselves. Marchionne has said since January that he preferred to keep Wrangler production in Toledo. FCA’s Toledo Assembly Complex is composed of two plants: one smaller body-on-frame plant that builds the Wrangler and another nearly new unibody plant that builds the Cherokee. The two lines share some common parts staging, but otherwise operate independently. The plan would require the unibody plant, locally known as Toledo North, to be converted to body-on-frame assembly. The redesigned Wrangler would launch there. Loss of the Cherokee is a blow to Toledo, which had sought to keep the vehicle and expand Wrangler production. Through August, the Cherokee is Jeep’s top-selling vehicle in the U.S., averaging 17,611 sales per month. However, that wound may be salved if new vehicles to be added prove as popular. FCA’s plan would ensure that Wrangler production would continue while the plant is retooled for the redesigned 2018 Wrangler. The off-roader is one of the automaker’s most popular and profitable vehicles. Production of the redesigned Wrangler and pickup is planned to reach 350,000 per year, according to suppliers briefed on the plan. The Cherokee would move, likely to Sterling Heights Assembly in Michigan, or possibly Belvidere Assembly in Illinois. Both plants are capable of building the Cherokee with little or no retooling, as the Cherokee shares a platform with the Chrysler 200 built in Sterling Heights and the Dodge Dart built in Belvidere. Converting Toledo Assembly to all body-on-frame construction would solve another problem for FCA, Marchionne hinted. It would allow FCA to retool Warren Assembly in Michigan, where it makes the hot-selling Ram 1500 pickup. Marchionne said that, like the Wrangler, he can’t afford to lose production of the Ram 1500 in order to retool. A Wrangler-based pickup has been on Jeep enthusiasts’ wish list since the brand showed the Jeep Gladiator concept in 2005. The Gladiator was built on a Ram 1500 frame and shared Wrangler styling. It is unknown whether the Wrangler-based pickup would be Gladiator-sized or smaller, to compete with the redesigned Chevrolet Colorado and GMC Canyon, as well as a potential Ford Ranger pickup. Either way, the Jeep badge and underpinnings should allow it to sell at a premium above those offerings. Unknown for now is what will happen to land the city of Toledo assembled for a possible Jeep expansion. Toledo economic development officials have sought ways to close the cost gap and keep Wrangler in its historic home. For years, Toledo had been quietly buying industrial land adjacent to FCA’s sprawling Toledo Assembly Complex in case expansion was needed. To date, more than 100 acres are available nearby. That land could be made available for suppliers, or it could be saved for future expansion of the current Wrangler line. Will the next Unlimited Wrangler look like this?? Are you find car like chrysler dodge caravan, toyota suv, jeep toronto, jeep wrangler, hyundai hatchback. Jeep Wrangler new model is looking very excellent and add many features. jeep wrangler keeps to deliver startling features and true looks with an superb off road capability within an affordable range.